Taib Mahmud’s Secret Bomoh – Exclusive! Famous quotes by the one and only Samy Velu ..
Is Idris Jala a liability for Najib? A Hari Raya Message For Taib Mahmud of Sarawak!! The Minister in the Chief Minister's Department said the people of Sabah have to appreciate and strengthen political stability at all costs as this is the formula that had allowed them to live in peace and harmony since times immemorial. Datuk Haji Nasir Tun Sakaran, Minister in the Chief Minister Department of Sabah. He stressed that respecting each others' belief, religion and race is as paramount and prerequisite to preserving stability in a diverse culture like Sabah. "Sabah is a good example in Malaysia in terms of political stability and a peaceful people because even though we come from a multi-cultural backgrounds where we have more than 30 ethnic groups with different religions, we we are able to tackle all kinds of negative influences that could affect our political stability." "Our effort to preserve peace and political stability therefore has contributed immensely to the progress we know in Sabah," he pointed out. Nasir did his primary and secondary education (St Patrick and Sabah College), all in Sabah. He graduated in Bachelor of Arts in Political Science and History at the University of San Francisco, USA (1977 - 1980). Being in politics for more than 20 years (since USNO time), has certainly made him a wise politician. He pays glowing tribute to the current Chief Minister, Datuk Musa Aman, whom he called a magnififcent Musa. “I call on the people to appreciate the Chief Minister's effort as under his leadership, the development in Sabah has been robust with many development projects completed and are taking shape right now,” he said. He further said: "What is more amazing is Musa’s courage in coming up with the biggest ever Sabah's budget which will provide for the impetus for nore rapid developments in the state including in rural areas." “Definitely, Musa has the poor folks in his mind, and for this he had programmes line-up for this group of people. We need to cooperate with the government's Halatuju to develop Sabah further, be it on providing better public facilities, infrastructures and education for our kids, or enhancing the usage of information technology to make our people a more informed society, therefore easier to adapt to new challenges. I fully support the Chief Minister's call for all leaders to go down to the field and to see for themselves the situation on the groun, listen to the villagers and supporters. Listen what they have to say and take note of their needs... Not merely go down there to inspect some on-going projects,” he said. “This brought me to recall my times when I was a student in the United States, whereby a positive element of unification was practised by us (students).We were in a team to do our project paper, even though we came from several countries like Hongkong, Singapore, Vietnam and the Philippines besides the America and Malaysia, we we really unified on a purpose, and this i cherish to this day. Even though I have long left my studying time, I bring with me the positive element of unification where religion, race and individuals' beliefs is a personal matter and should never be made as stumbling block. This should also be the case in our society here, and yes we in Sabah practiced this tolerance." "When we respect and can accept each individual's personal differences in our team or the multi-cultural society in Sabah (understanding), we will absolutely be able to sit peacefully and discuss for our professional goal for Sabah. When we have agreed to one system to reach the goal which should be beneficial and fruitful for the people, we have reached unification, an important element in our effort to achieve the goal toward a change of a more progressive development in Sabah now that would contribute a success both in humanity and economic stability which we have experienced all these years!" "Actually I never think of being in a political career but my family and close friends have given me the suggestion, supporting me all the way. Their reasons are people always come to me for help and advices with their problem. Finally I took the chance in politics in 1990 representing USNO candidate and from that day, I never come to a halt in politics." Datuk Nasir, when asked for the challenges that he has gone through and how he could be able to tackle and cope with them shares "Challenges? Yes, surely I am not exceptional with challenges like many other leaders even though each leader may experience them in a different way, different environment and time, I believe all leaders in politics (olden days and today) or leading executives will face a challenge. For example, in the olden days, the human society usually need the human basic need which are food and shelter but as time passes, besides food and shelter, people need better facility, education and economy and they expect their leaders to help them. These are among the various challenges that I have come across while in politics and dealing with the people." "Besides for themselves, they also need assurance for a stable economy for their family in years to come or I would say a future for their family when they no longer could be able be a bread winner (retires or die) so for the love of their family, they need a continued economy in our state where their family could be able to survive. Their concern is ours too, in another word, for our next generation. In this scenario, a stable economy in Sabah for the future too is very important and each leader has to find more promising formula to achieve a myriad of economic stability for today and the future and together in the Barsian Nasional team here, we struggle in taking more effort for a continued economic stability." "We need to be thankful that with the political stability too, we can keep on discovering new ways and knowledge to upgrade the economy, facility and new technologies. Even though we have achieve this political stability and economic progress also magnificent development for our state and for the people, we must not stop taking an effort for more improvement so that we could also be prepared for the rainy days resembling the proverb 'keep an umbrella before it rains." "You know, without any signs, I have experienced many and many challenging role and situation in serving the community especially my supporters. However, I have been focusing for the implementation of the community development especially for the poor, both in term of humanity and their facility or economy. I have been meeting their needs based on my capability for example, some community come to me asking for a house or improving their lives and their problem have been solved." Asked how he could be able to cope with all their problem and emotion, Datuk Nasir shares "Patience and being humble in listening to them or approaching them are the best way in handling the situation. I prefer to be humble so that the people who come to see me will feel comfortable to talk about their problem. Some of them may come from all over Sabah or rural areas to see me with their problem or request so I must listen to their worry and be humble." 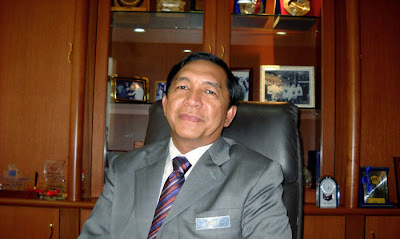 Datuk Haji Nasir leadership success continued when victory was on his side during the general election in early 2008. Datuk Nasir, representing Barisan Nasional Candidate (DUN N53) in Senalang (Semporna) had won an overwhelming votes, 6,083 from the people, defeating the opposition (PKR) Hasaman Bin Sagaran (628 votes) and two independent candidates (around 600 votes). He even achieved a majority of over 4,000 votes.